1Lt Charles A. Austin (P) - Flew as CoPilot with a combat orientation Pilot on two missions (311, 313). Flew as a substitute CoPilot with another crew who were completing their last combat mission (333). Completed 35 mission combat tour on 13 April 1945. 2Lt Arthur E. Johnson (CP) - Did not fly with the 1Lt Austin crew on three missions (311, 313, 333, 357). Flew as CoPilot with other Pilots on three missions (311, 313, 327). Upgraded from CoPilot to Pilot on orders dated 3 April 1945. Flew on two missions as 1st Pilot: As combat orientation Pilot on the 2Lt Jack McGuffin, Jr. crew's first combat mission (357); As Pilot with other members of the 1Lt Austin crew on their 35th and final mission (36) on 14 April 1945. 2Lt Clinton J. Morgan (B) - Flew on fifteen missions with the 1Lt Austin crew (311, 313, 314, 315, 317, 318, 319, 320, 324, 325, 328, 351, 355, 356, 357). Flew on six missions with other Pilots (320, 334, 359, 360, 361, 364). Did not complete his 35 mission combat tour. S/Sgt Edward C. Stuckey (WG/TOG) - 1Lt Austin crew missions: Fourteen as Waist Gunner (311, 313, 314, 315, 317, 318, 319, 320, 324, 325, 326, 328, 330, 336); Fifteen as Togglier when crew discontinued using a Waist Gunner (337, 338, 340, 341, 342, 343, 347, 348, 349, 350, 352, 353, 354, 359, 360). Flew one mission as Togglier with another Pilot (330A). Did not complete his 35 mission combat tour. 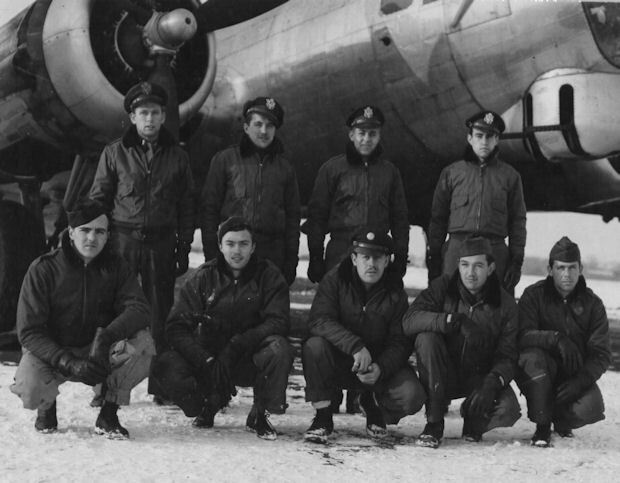 2Lt Florian T. Kokoska (N), T/Sgt Howard L. Ingles (E), T/Sgt Burnell R. Kummer (R), S/Sgt Stanley A. Danielson (BTG) and S/Sgt Thomas R. Krouse (TG) - Flew on all of the 1Lt Austin crew missions except for mission 333. Completed their 35 mission combat tour on 14 April 1945 (mission 360) with regular crew CoPilot 2Lt Arthur E. Johnson flying as 1st Pilot. VI (Voice Interpreter) crewmen - VI's flew with the 1Lt Austin crew on seven missions (315, 319, 320, 325, 330, 333, 349).